At least once, every trekking enthusiasts want to be at the base camp of the world’s tallest peak Mt. Everest. A trip to Everest base camp starts with an exciting flight from Kathmandu to Lukla. 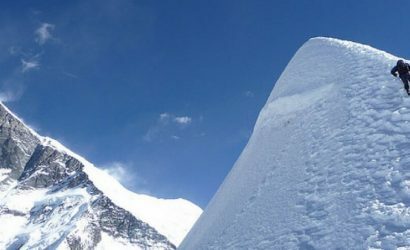 In this short trek, we’ll experience a vast wilderness of Everest region. We’ll also witness a glimpse of Sherpa culture and traditional lifestyle influenced by Buddhism religion. We’ll explore the Tengboche monastery before heading towards Dingboche. 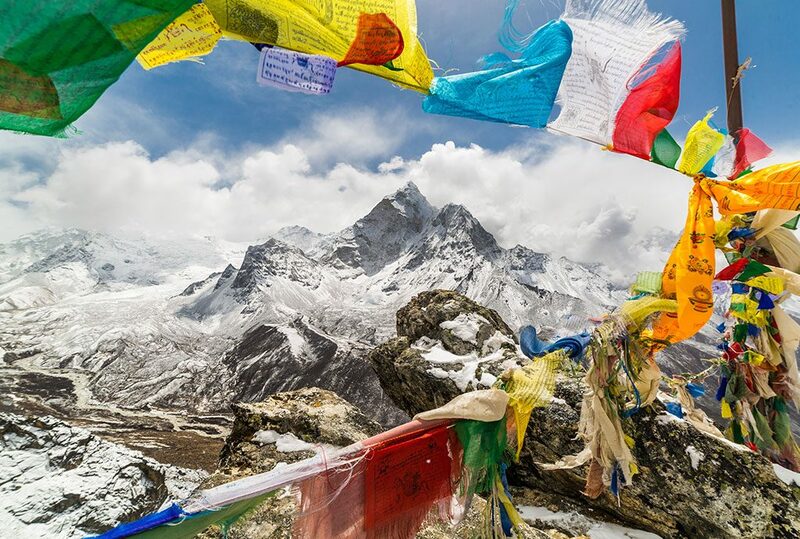 From the top, we’ll get fabulous views of most beautiful Ama Dablam peak. Hiking to one of the best vantage points, Kala Patthar is center of attraction of this trek. From the viewpoint, we’ll get the best close-up view of Mt. Everest. I bet in the whole world except this place you’ll not find a better place to get the closest view of the tallest peak in the world. Another exciting part of this trek to Everest base camp is the helicopter ride back to Kathmandu. In this short trekking package, you can experience both unparalleled beauties of hiking in the high alpine meadows and fly to the region of Lukla. On this heli ride, you’ll get an awesome view of a snow-capped mountain, beautiful landscape, and quaint village settlement. Aerial sightseeing offers you unforgettable travel experience for a lifetime !!! We'll begin our trip by taking an early flight from Kathmandu to Lukla. After taking short rest we'll head towards Phakding. Following the bank of Dudh Koshi river with the amazing view of a beautiful mountain like Gongla, Nupla, and Karyolung we'll reach Phakding. We'll spend a night at the teahouse in Phakding. Today the trek begin via forest trail and head toward Namche Bazaar. On the trail, we'll cross several suspension bridges. The trial involves high and steep climbing. Trail also lead via Sagarmatha National Park (Mt. Everest is also known as Sagarmatha in Nepal). After the long tiring hike, we'll reach Namche Bazaar. We'll spend a night at the teahouse in Namche Bazaar. Today is set for acclimatization day. Actually, it is extremely important to prepare our body for the higher altitudes in the coming days. Namche Bazaar is a beautiful city full of a vibrant market with shops selling essential trekking gears and souvenirs. Here, we can find several bakeries and cafe serving fresh baked bread and cakes. We'll hike to a small village that is home to Hilary school founded by Sir Edmund Hillary. After exploring Namche Bazaar we'll be back to our teahouse for an overnight stay. Today we begin our trek early in the morning via narrow trails. Throughout the trail, we'll get astonishing views of Mt. Amadablam, Mt. Thamserku, Mt. Everest etc. 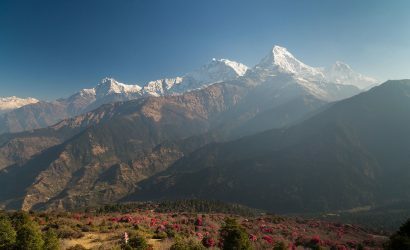 Continue our trek via rhododendron forested area we'll reach Tengboche village. Here we'll visit Tengboche monastery-one of the largest monasteries of Khumbu region. We'll spend a night at the teahouse in Tengboche. On this day, we'll head toward Dingboche, a famous place for a summer settlement for yak grazing. The first part of the trail we'll walk downhill via the rhododendron forests. After a few steep climbs on mani stones, we'll reach Pangboche. Our trek continues and passes Shomare and Orsho village and we'll reach Dingboche for an overnight stay. Similar to the acclimatization day in Namche Bazaar. Normally, to adjust with the high altitude we should trek to a higher point and then go down for a sleep. We'll hike to the top of the hill for the better views of giant Himalayas. As soon as we finished our hike we'll head back to our tea house where we took shelter last night. Today we begin our walk via grassland area and cross the suspension bridge and reach to Thukla. After a steep hike, we'll cross the Thukla Pass. Here we'll see different colorful prayer flags and chorten. We'll notice a cemetery ground with many stone memorials, each one dedicated to the climbers who had lost their lives on the mountain. 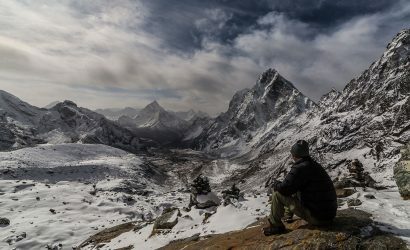 Lobuche offers stunning mountain views. We'll spend our night at the teahouse in Lobuche. Today's trek will be most exciting one as we'll head towards Everest base camp via Gorak Shep. The trail is quite up and downhill. 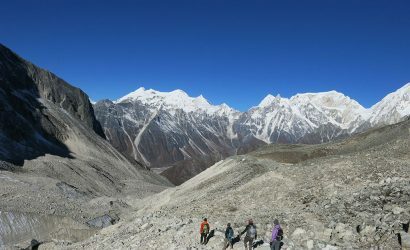 We'll walk over the wide trails with the view of Khumbu glaciers. Enjoying the mountain view we'll reach Gorak Shep. Here we'll take some rest and then head toward Everest Base Camp, the main attraction of the trek. The major highlight of the day is breathtaking mountain views including Mt. Everest, Mt. Nuptse, Mt. Pumori, and Mt. Khumbutse. Here we'll take some time to soak in the beauty of the mountains. After capturing these beautiful moments we'll be back to Gorak Shep for an overnight stay. Today, early in the morning we'll hike up to Kala Patthar. Kala Patthar is the world famous vantage point for the best close-up view of Mt. Everest. From the top, we'll get an incredible mountain view including Mt. Khumbutse, Mt. Changtse, Mt. Lhotse, Mt. Nuptse, and of course Mt. Everest. Truly breathtaking !!! After admiring the view of 360-degree panoramic mountain view we'll descend back to Gorak Shep. Then we'll fly back to Lukla by Chartered Helicopter enjoying the panoramic Himalayan views. This'll be our last day on Lukla we'll recall and cherish the most exciting and memorable trip. We'll spend a night at the teahouse in Lukla. Today, early in the morning, we'll fly back to Kathmandu from Lukla. For the last time, we'll see the glimpse of Mt. Everest and other surrounding peaks. 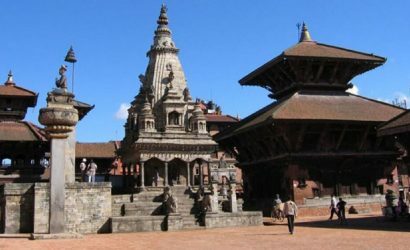 On reaching Kathmandu, after some refreshment, you can enjoy shopping and walk around the city. In evening, we'll celebrate our successful completion of Everest base camp trek. 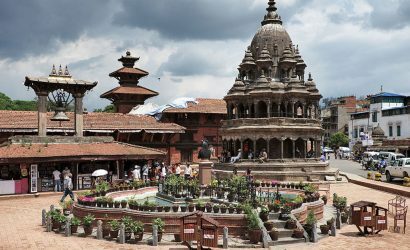 Final day in Nepal, depending on your flight schedule our representative will drop you at an international airport for your home destination. 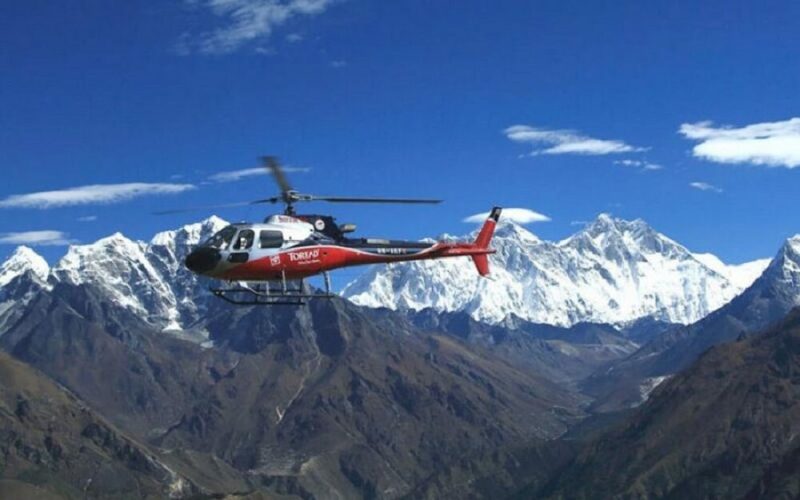 The above itinerary for the trek to Everest base camp and helicopter ride back is a standard package. If you want to make it long or short we can customize it as per your requirements. For detail info, you can contact us.